Aerial view of Happy Valley Ranchette development, southwestern Laramie County. Photograph by Jon P. Mason. Any use of trade, product, or firm names in this report is for descriptive purposes only and does not imply endorsement by the U.S. Government. Vertical coordinate information is referenced to the National Geodetic Vertical Datum of 1929 (NGVD 29). Elevation, as used in this report, refers to distance above the vertical datum. *Transmissivity: The hydraulic conductivity of an aquifer times the aquifer thickness. The standard unit for transmissivity is cubic foot per day per square foot times foot of aquifer thickness [(ft3/d)/ft2]ft. In this report, the mathematically reduced form, foot squared per day (ft2/d), is used for convenience. The U.S. Geological Survey, in cooperation with the Wyoming State Engineer’s Office, created a hydrogeologic database for southwestern Laramie County, Wyoming. The database contains records from 166 wells and test holes drilled during 1931–2006. 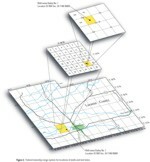 Several types of information, including well construction; well or test hole locations; lithologic logs; gamma, neutron, spontaneous-potential, and single-point resistivity logs; water levels; and transmissivities and storativities estimated from aquifer tests, are available in the database. Most wells and test holes in the database have records containing information about construction, location, and lithology; 77 wells and test holes have geophysical logs; 70 wells have tabulated water-level data; and 60 wells have records of aquifer-test results. 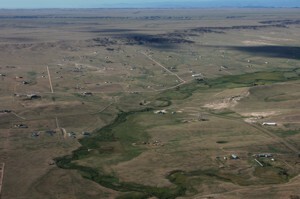 The High Plains aquifer in Laramie County, Wyoming, is an important ground-water resource for agriculture, municipal, industrial, and domestic uses. Currently (2006), Laramie County is experiencing substantial population growth. From 1950 to 2000, the population of Laramie County increased from 47,662 to 81,607 (U.S. Census Bureau, 2006). As population increased, ground-water demand increased. The number of registered ground–water withdrawal wells in Laramie County with a priority date earlier than 1951 is about 1,400, whereas the number with a priority date before 2001 is more than 8,000 (Wyoming State Engineer’s Office, 2006). Water withdrawn from the High Plains aquifer in southwestern Laramie County is of particular interest to water-resource managers because the area contains the municipal well fields for the city of Cheyenne and is experiencing rapid growth in both urban and rural population. Many hydrogeologic investigations have been conducted in this area to characterize the physical and hydraulic properties of the High Plains aquifer (Ogle and Jordan, 1997). Results of these investigations were published in more than 50 reports. Most of these reports are not available in a digital format, and only limited paper copies often are available. In addition to published reports, unpublished sources of physical and hydraulic information are available [for example, ground-water well-inventory files from the U.S. Geological Survey (USGS) and water-well permits from the Wyoming State Engineer’s Office (WSEO)]. To help make physical and hydraulic information from these sources more readily available, the USGS, in cooperation with the WSEO, compiled this information into an electronic database. Wells and test holes with information in the database are listed in Appendix 1. The purpose of this report is to describe the hydrogeologic data for southwestern Laramie County contained in the database developed by the USGS in cooperation with the WSEO. The database contains records from 166 wells and test holes located within a 382-mi2 area of southwestern Laramie County (fig. 1). Many of the reports listed in Ogle and Jordan (1997) were used as record sources for the database. Additional sources used for the database that are not included in Ogle and Jordan (1997) are listed in Appendix 2. Inclusion of records in the database does not imply USGS endorsement of the accuracy or content of the records. In cases when multiple record sources were available for a well, record discrepancies sometimes existed between sources. In those cases, an assessment of the record sources was conducted to determine which source was likely to be most accurate. In most cases, discrepancies between record sources were minor (for example, a 5-ft difference in reported well depth). Figure 1. Location of study area, southwestern Laramie County, Wyoming. Interactive map with links to data. High-resolution print version (PDF, 15.7 mb). Well and test-hole location data came from several sources, including WSEO well permits, USGS ground-water well-inventory files, and the Cheyenne Board of Public Utilities. Well and test-hole locations are presented using the Federal township-range system of land subdivision. For example, a well with the location of SE NW sec 26 T14N R68W would be located in the southeast quarter of the northwest quarter of section 26 in Township 14 North, Range 68 West (fig. 2). Figure 2. Federal township-range system for locating wells and test holes. The types of records contained in the database include well location, well construction, lithologic logs, geophysical logs, and aquifer-test results. Most wells and test holes in the database have records for construction, location, and lithology. Additionally, 77 wells or test holes have geophysical logs, and 60 wells have records of aquifer-test results. Appendix 1 lists all wells and test holes and gives a description of the types of information available in the database for each. 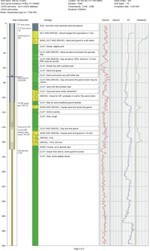 Diagrams of well construction and lithologic logs were created using the software package LogPlot 2003. The information used to construct the diagrams primarily came from WSEO well permits and consultant reports. About 80 wells and test holes in the database have detailed lithologic records acquired from consultant reports; lithologic records from the rest of the wells mainly came from WSEO well permits and typically contained less detailed descriptions than those acquired from consultant reports. Geophysical logs also are available for 77 wells and test holes in the database. The types of geophysical logs in the database include gamma, neutron, spontaneous-potential, and single-point resistivity. Most of the geophysical logs in the database were digitized from scanned copies. Inputting the logs into LogPlot 2003 allowed individual log scales to be manipulated so that scales could be normalized for most logs. Some geophysical logs in the database were inserted as scanned images, and scales were not normalized. Water-level records are available for 70 wells in the database. Water-level records available for wells range from a single water-level value to daily water-level values recorded by an electronic data logger. In addition to the tabulated water-level records available, many wells and test holes contain water-level information in their construction diagrams. Aquifer-test results are available from published reports for 60 wells in the database. All 60 wells have records containing at least one transmissivity estimate calculated from aquifer tests. In addition, some wells have one or more reported storativities. Readers should note that available information regarding aquifer-test length indicates that the drawdown part of the test typically was conducted for 1 day to a few days. Estimated storativities generally indicated confined conditions. Because these aquifer tests were relatively short in duration, storativities could be small because the aquifer is confined or because the length of test was not long enough to encounter delayed yield in cases where unconfined conditions exist. A summary of available aquifer test results is presented in Appendix 3. Well name – Name of well used in WSEO well permit. USGS well number – Fifteen-digit station identification number used in USGS NWIS database. Well permit number – WSEO well permit number. Location – Well location given in the Federal township-range system of land subdivision. Elevation – Elevation of land surface at well location, in feet above National Geodetic Vertical Datum of 1929. Transmissivity – The hydraulic conductivity of an aquifer times the aquifer thickness. The standard unit for transmissivity is cubic foot per day per square foot times foot of aquifer thickness [(ft3/d)/ft2]ft. In this report, the mathematically reduced form, foot squared per day (ft2/d), is used for convenience. Storativity - The volume of water an aquifer releases from storage per unit surface area of the aquifer per unit change in hydraulic head (dimensionless). Storativity is the same as storage coefficient. Depth drilled – Depth from land surface to the bottom of the original borehole, in feet. May be greater than well depth if borehole is backfilled. Well depth – Depth from land surface to bottom of well, in feet. Completion date – Date well construction was completed. Not all well and test-hole records contain complete header information. 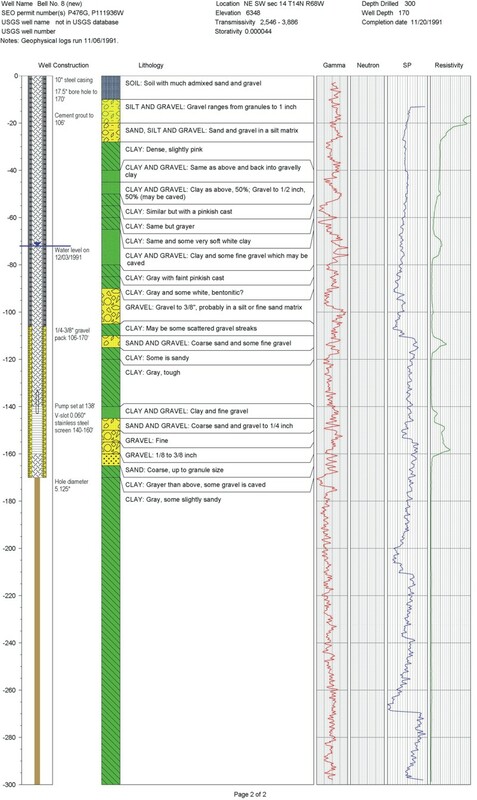 Diagrams showing well or test-hole construction and the lithology that was described from the borehole or drill cuttings are shown below the record header on the left side. If available, selected geophysical logs are shown to the right of the lithology diagram (fig. 3). Figure 3. Sample well record. Larger screen version (218 kb). Appendix 2. Annotated bibliography of publications used as sources of data subsequent to Ogle and Jordan (1997). Black and Veatch, 2004, The 2003 water and wastewater master plans: report prepared for the city of Cheyenne, 3 books, 10 volumes, variable pagination. The master plan describes a 10-year capital improvement and financing plan for the Cheyenne Board of Public Utilities. It also forecasts the facilities that may be needed to provide adequate and reliable water and wastewater services for 20 to 50 years into the future. Location: Cheyenne Water and Sewer Department. Hatton Water Consultants, 1993, Summary report on drilling, testing and completion well no. 24: Wheat Ridge, Colorado, report prepared for Coastal Chem, Inc., 13 p. (including unnumbered pages), 1 plate. This report summarizes the construction and testing of Coastal Chem well no. 24. The report includes geophysical logs (gamma, neutron, spontaneous-potential, and resistivity) from a nearby test hole, as well as results from a 4-hour, stepped-rate aquifer test and from a 24-hour, constant-rate aquifer test conducted at well no. 24. Well no. 24 was completed to a depth of 273 ft in the Ogallala Formation of the High Plains aquifer. Drawdown data collected during the constant-rate aquifer test were used to estimate specific capacity [1.4 (gal/min)/ft] and transmissivity (710 ft2/day). The sustainable production rate for well no. 24 was estimated to be 200 gal/min. Location: Records of the Wyoming State Engineer’s Office. Hatton Water Consultants, 1993, Summary report on drilling, testing and completion well no. 25: Wheat Ridge, Colorado, report prepared for Coastal Chem, Inc., 12 p. (including unnumbered pages), 1 plate. This report summarizes the construction and testing of Coastal Chem well no. 25. The report includes geophysical logs (gamma, neutron, spontaneous-potential, and resistivity) from a nearby test hole, as well as results from a 4-hour, stepped-rate aquifer test and from a 24-hour, constant-rate aquifer test conducted at well no. 25. Well no. 25 was completed to a depth of 278 ft in the Ogallala Formation of the High Plains aquifer. Drawdown data collected during the constant-rate aquifer test were used to estimate specific capacity [2.6 (gal/min)/ft] and transmissivity (1,660 ft2/d). The sustainable production rate for well no. 25 was estimated to be 400 gal/min. JR Engineering, 2002, Summary report on drilling, testing, and completion wells 27 and 28: Greenwood Village, Colorado, report prepared for Coastal Chem, Inc., 23 p. (including unnumbered pages), geophysical logs. This report summarizes the construction and testing of Coastal Chem wells nos. 27 and 28. The report includes lithologic and geophysical logs (gamma, neutron, spontaneous-potential, and resistivity). Results from stepped-rate and constant-rate aquifer tests also are provided. Well no. 27 was installed to a depth of 335 ft, and well no. 28 was installed to a depth of 330 ft. Both wells were completed in the Ogallala Formation of the High Plains aquifer. Drawdown data collected during the constant-rate aquifer tests were used to estimate transmissivity of the aquifer near well no. 27 (4,250 ft2/d) and near well no. 28 (5,300 ft2/d). The sustainable production rates for well nos. 27 and 28 were estimated to be 325 and 165 gal/min, respectively. JR Engineering, 2005, Cheyenne Belvoir Ranch level II study: Greenwood Village, Colorado, report prepared for the Wyoming Water Development Commission, variable pagination, 10 plates. This report includes ancillary information, descriptive field data, and engineering processes used to drill, complete, and airlift nine test holes in preparation for drilling, completion, and aquifer testing of a single production test well for the fiscal year 2005 Cheyenne Belvoir Ranch Test Well Project. This project included hydrologic and geologic reconnaissance, test-hole exploration, aquifer delineation, potentiometric-surface mapping, geologic correlation, geophysical analysis, and test-hole design and completion through the base of the Ogallala Formation of the High Plains aquifer beneath the Cheyenne Belvoir Ranch. This report also includes the results of drilling and testing the Belvoir no. 5 well. Location: Wyoming Water Development Commission. Weston Engineering, Inc., 1998, Cheyenne three well rehabilitation project report: Laramie and Upton, Wyoming, report prepared for the city of Cheyenne, variable pagination. This report documents the replacement of the Bell no. 8, King no. 5, and Koppes no. 2 wells. 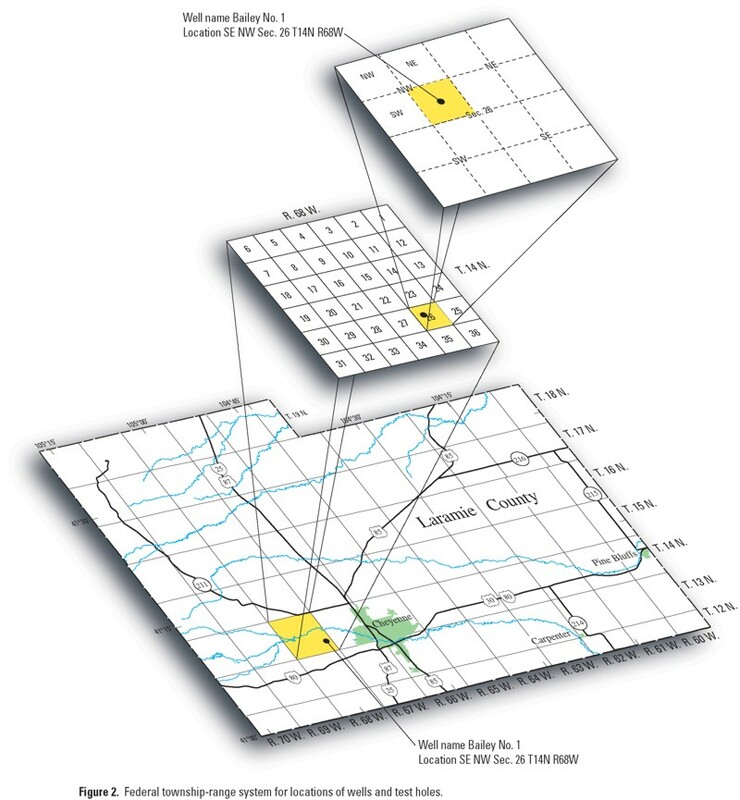 It provides a summary of hydrologic data from recent Cheyenne well-field projects. The results of aquifer tests conducted at the replacement wells were used to estimate transmissivities and storage coefficients. Lithologic logs for the replacement wells and geophysical logs from one test well also are included in the report. Water-quality data are presented. Weston Engineering, Inc., 1999, Cheyenne water well rehabilitation and exploration project report: Laramie and Upton, Wyoming, report prepared for the city of Cheyenne, variable pagination. This report documents the replacement of the Koppes no. 3 well, the installation of a deep test well, the drilling and geophysical logging of five test holes, and the conversion of several old municipal wells to monitoring wells. The results of an aquifer test conducted at the replacement well were used to estimate transmissivity. Water-quality data are presented. Weston Engineering, Inc., 1999, Cheyenne fiscal year 1999 well rehabilitation project final report: Laramie and Upton, Wyoming, report prepared for the city of Cheyenne, variable pagination. This report documents the replacement of five municipal wells and the conversion of four old municipal wells to monitoring wells. The results of aquifer tests conducted at the replacement wells were used to estimate transmissivities and storage coefficients. Lithologic logs for the replacement wells also are included in the report. Water-quality data are presented. Weston Engineering, Inc., 2000, Project report Cheyenne fiscal year 2000 well rehabilitation project: Laramie and Upton, Wyoming, report prepared for the city of Cheyenne, variable pagination. This report describes the replacement of the Bell no. 5, Merrit no. 6, and State no. 2 wells. The results of aquifer tests conducted at the replacement wells were used to estimate transmissivities and storage coefficients. Lithologic logs for the replacement wells and geophysical logs from one test well also are included in the report. Water-quality data are presented. Willard Owens Associates, Inc., 1981, Completion report for well no. 22: Denver, Colorado, report prepared for Wycon Chemical Company, 20 p. (including unnumbered pages), 1 plate. This report summarizes the construction and testing of Wycon Chemical Company well no. 22. The report includes lithologic and geophysical logs (gamma, spontaneous-potential, and resistivity) from a nearby test hole, as well as results from a 6-hour, stepped-rate aquifer test and from a 24-hour, constant-rate aquifer test conducted at well no. 22. The well was completed in the Ogallala Formation of the High Plains aquifer to a depth of 260 ft. Drawdown data collected during the constant-rate aquifer test were used to estimate transmissivity (472 ft2/d) near the well. The report also describes the potential for hydraulic interference between Wycon Chemical Company well no. 22, Wycon Chemical Company well no. 17, and the Cheyenne Board of Public Utilities Weber well. 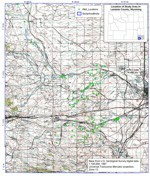 Willard Owens Consultants, Inc., 1987, Report of test drilling and completion of Wycon well no. 23: Denver, Colorado, report prepared for Wycon Chemical Company, 18 p. (including unnumbered pages), geophysical logs. This report summarizes the construction and testing of Wycon Chemical Company well no. 23. The report also includes lithologic and geophysical logs (gamma, spontaneous-potential, and resistivity) from four nearby test holes, as well as water-quality analyses of water sampled from the well. Well no. 23 was installed to a depth of 290 ft and was completed in the Ogallala Formation of the High Plains aquifer. A 7-hour, stepped-rate aquifer test and a 24-hour, constant-rate aquifer test were conducted. Drawdown data collected during the constant-rate aquifer test were used to estimate the specific capacity [4.1 (gal/min)/ft] of the well and transmissivity (1,220 ft2/d) of the aquifer near the well. The sustainable production rate for well no. 23 was estimated to be 500 gal/min. Willard Owens Consultants, Inc., 1990, Summary report on test hole drilling and water supply development: Denver, Colorado, report prepared for Coastal Chem, Inc., 11 p. (including unnumbered pages), geophysical logs. This report contains lithologic and geophysical logs (gamma, neutron, spontaneous-potential, and resistivity) from four test holes drilled on Coastal Chem property. Aquifer-test results from three test wells are presented. Recommendations are made to locate five new production wells for future plant expansion. Willard Owens Consultants, Inc., 1990, Summary report on production well drilling, testing and completion well No. 8A: Denver, Colorado, report prepared for Coastal Chem, Inc., 13 p. (including unnumbered pages), 1 plate. This report summarizes the construction and testing of Coastal Chem well no. 8A, which was a replacement for well no. 8. The report also includes geophysical logs. Well no. 8A was installed to a depth of 200 ft and was completed in the Ogallala Formation of the High Plains aquifer. An 8-hour, stepped-rate aquifer test and a 24-hour, constant-rate aquifer test were conducted. Drawdown data collected during the constant-rate aquifer test were used to estimate transmissivity (1,600 ft2/d) and storativity (1.8 X 10-4) of the aquifer near the well. The specific capacity of well no. 8A was estimated to be 5.9 (gal/min)/ft, and the sustainable production rate was estimated to be 500 gal/min. Willard Owens Consultants, Inc., 1990, Summary report on production well drilling, testing and completion well No. 16A: Denver, Colorado, report prepared for Coastal Chem, Inc., 13 p. (including unnumbered pages), 1 plate. This report summarizes the construction and testing of Coastal Chem well no. 16A, which was a replacement for well no. 16. The report also includes geophysical logs (gamma, neutron, spontaneous-potential, and resistivity) from a nearby test hole. Well no. 16A was installed to a depth of 350 ft and was completed in the Ogallala Formation of the High Plains aquifer. An 8-hour, stepped-rate aquifer test and a 24-hour, constant-rate aquifer test were conducted. Drawdown data collected during the constant-rate aquifer test were used to estimate transmissivity (520 ft2/d) and storativity (4.3 x 10-3) of the aquifer near the well. The specific capacity of well no. 16A was estimated to be 2.5 (gal/min)/ft, and the sustainable production rate was estimated to be 250 gal/min. Willard Owens Consultants, Inc., 1991, Summary report on drilling, testing and completion well no. 26: Denver, Colorado, report prepared for Coastal Chem, Inc., 12 p. (including unnumbered pages), 1 plate. This report summarizes the construction and testing of Coastal Chem well no. 26. The report includes geophysical logs (gamma, neutron, spontaneous-potential, and resistivity) from a nearby test hole, as well as results from a 4-hour, stepped-rate aquifer test and from a 24-hour, constant-rate aquifer test conducted at well no. 26. Well no. 26 was installed to a depth of 185 ft and was completed in the Ogallala Formation of the High Plains aquifer. Drawdown data collected during the constant-rate aquifer test were used to estimate transmissivity (490 ft2/day) and storativity (1.4 x 10-2) of the aquifer near the well. The specific capacity of well no. 26 was estimated to be 2.4 (gal/min)/ft, and the sustainable production rate was estimated to be 240 gal/min.